Glasgow not only offers a rich vein of culture, shopping delight and diverse cuisine but also an architectural fantasy – a Victorian city with a twenty-first century attitude, all reflected in eclectic buildings, diverse theatrical and musical venues and innovative restaurants and cafes. Here are five ways to enhance your enjoyment of a visit to Scotland’s revitalized largest city. Featured in a myriad of movies (one being Brad Pitt’s World War Z as present-day Philadelphia), Glasgow has left behind its gritty image as the once mighty powerhouse of industrial Britain and enthusiastically embraced a cleaner, more wholesome one based on tourism and financial services, with creative buildings enlivening a largely pedestrian downtown. Walk along its broad, busy boulevards and enjoy 200-year-old rose and honey sandstone Victorian and Edwardian mansions snug against Italianate steeples and neo-Gothic towers. City Chambers, headquarters of Glasgow City Council: an imposing structure built in 1888 in the Italian Renaissance style, with free tours allowing visitors to see its magnificent marble staircases, debating chamber and lavish banqueting hall. Outside, spacious George Square is adorned with statues of civic leaders. Princes Square Shopping Centre: With its magnificent peacock metal art façade, it is among several buildings that echo the art nouveau inclinations of Glasgow’s favorite architectural son, Charles Rennie Mackintosh (1868–1928). Glasgow School of Art: Considered Mackintosh’s finest building, it hosts one of Britain’s pre-eminent schools of art, design and architecture. A small display room inside grants insights into the life and work of the famed architect and visitors can also take a guided tour. As the old building is closed for renovation, a visit to Mackintosh House – a reconstruction of the designer’s home with many original furnishings – is recommended. So proud is Glasgow of its culture, its museums are free and they offer varied collections. Riverside Museum: the city’s newest, won last year’s European Museum of the Year Award. 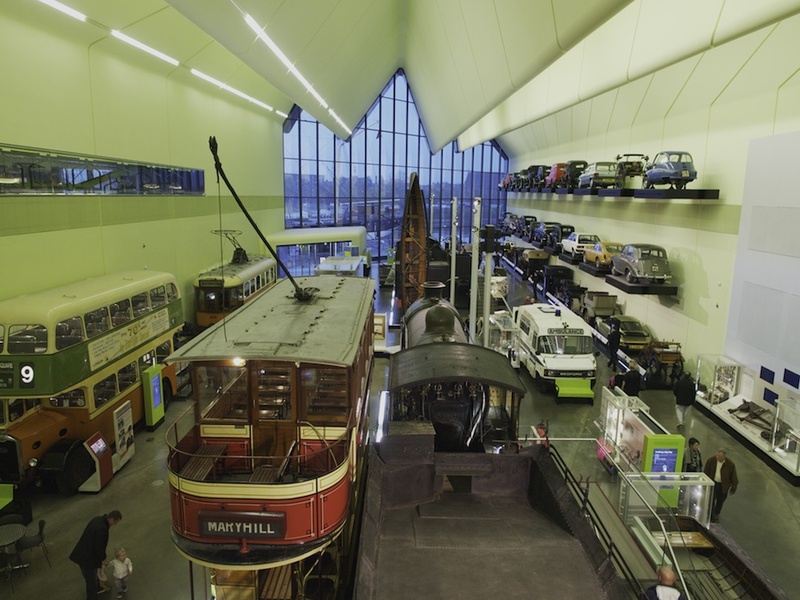 Focusing on transport, it has over 3,000 objects span two floors with an impressive array of objects ranging from skateboards and vintage cars to prams, locomotives and buses. It even has the replica of an old cobbled-stone Glaswegian street with stores dating from 1895 to the 1980s and horse-drawn carriages and trams in front. Berthed outside, the Tall Ship, Glenlee, Britain’s only floating Clyde-built sailing ship, is free to explore. In contrast, Kelvingrove Art Gallery and Museum is an iconic building opened in 1901 in Spanish baroque style with a façade of vivid Locharbriggs red sandstone. Housing an amalgam of exhibits ranging from arms and armor to natural history and art, its painting collection includes works by the Old Masters, French Impressionists, Dutch Renaissance, Scottish Colorists and exponents of the Glasgow School, with Salvador Dalí’s ‘Christ of Saint John of the Cross’ proudly on display on the first floor. The 19th century People’s Palace and Winter Gardens at Glasgow Green is the city’s museum of social history reflecting life from 1750 to the present. Among its artifacts are a one-room tenement home, a tin and brick World War Two air-raid shelter and videos featuring some of the city’s most known entertainers and civic leaders. An elegant glass conservatory at the rear is a café where visitors relax among tropical plants. Don’t miss the Doulton Fountain outside, the world’s largest terracotta fountain. 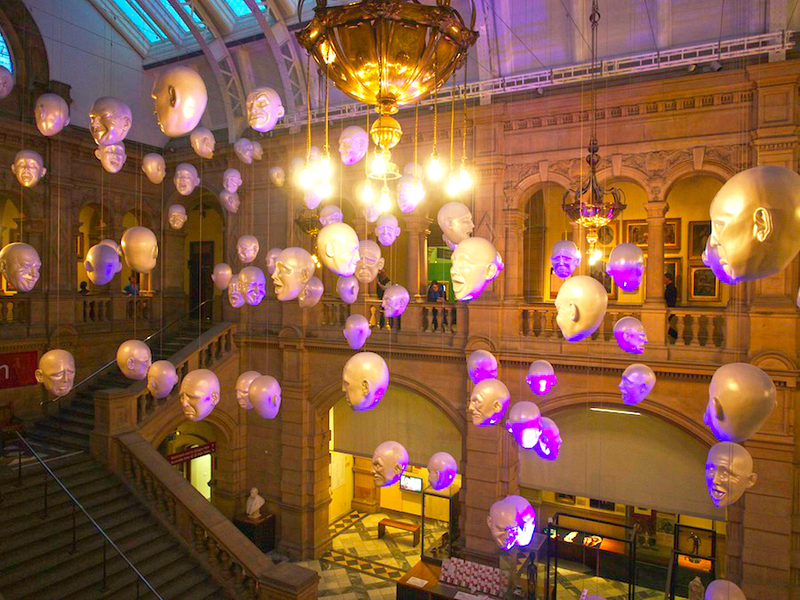 Situated in the heart of the city in a neo-classical building with a portico of huge Corinthian columns, Glasgow’s Gallery of Modern Art (GoMA) highlights worldwide artists in painting, sculpture, prints, photography, video and installations. With performances stretching across the entire spectrum, from contemporary and classical to Celtic and country, it is little surprise Glasgow was named UNESCO City of Music in 2008. Venues are impressive by virtue of their contrasting nature, from King Tut’s Wah Wah Hut (consistently voted top live music venue in the UK), the Barrowlands, O2 Academy, the Scottish Exhibition and Conference Centre and Glasgow Royal Concert Hall. The city is also home to the Scottish Opera, the Royal Scottish National Orchestra, the BBC Scottish Symphony Orchestra, the National Youth Orchestra of Scotland and the Royal Scottish Academy of Music and Drama (RSAMD). Theatre Royal, the city’s oldest venue, resembles a jewelry box, with a vivid gold and crimson auditorium and plush turquoise seating and carpeting. It features a range of performances from opera and ballet to contemporary dance, as well as adaptations of classical plays such as those of Agatha Christie and J.B. Priestly. The Royal Concert Hall hosts around 400 performances annually. Indicating its variety, long-time American pianist and songwriter Neil Sedaka entertained there earlier this month as did James Ellroy, best-selling crime author. It is also the main venue for Celtic Connections, the world’s largest winter music festival, and home to the Royal Scottish National Orchestra. For something entirely different, try Club Noir, a popular burlesque venue at the O2 Academy. The Tron, in a hip area of town known as ‘Merchant City,’ houses three intimate performance spaces, a bar and a café. The resident Tron Theatre Company hosts innovative and avant-garde plays including ‘Colquhoun & McBryde’ about the flamboyant lives of two Scottish artists lauded in London years ago. An integral part of Glasgow’s culture is soccer as reflected in the century-old rivalry between its two leading teams, Celtic and Rangers, the former being the richest and most successful club in the country. A special VIP package launched by Celtic makes for an enjoyable afternoon, with complimentary parking, hot food and drinks at Café 1888, as well as excellent match seats. With the rising popularity of Glasgow among international and domestic tourists, hotels have spouted in and around the city. Hotel du Vin: a Victorian-style, honey-colored property located in the quiet, leafy West End, consists of five 19th century townhouses linked together. High ceilings with ornate stuccos, marble fireplaces, vintage clocks on mantelpieces and heavy embroidered drapes are hallmarks of its elegance. Hotel Indigo: once the former 19th century Scottish Power station, it is a chic boutique downtown property that pays homage to Glasgow’s intriguing history, dedicating both rooms and corridors to the city’s development. 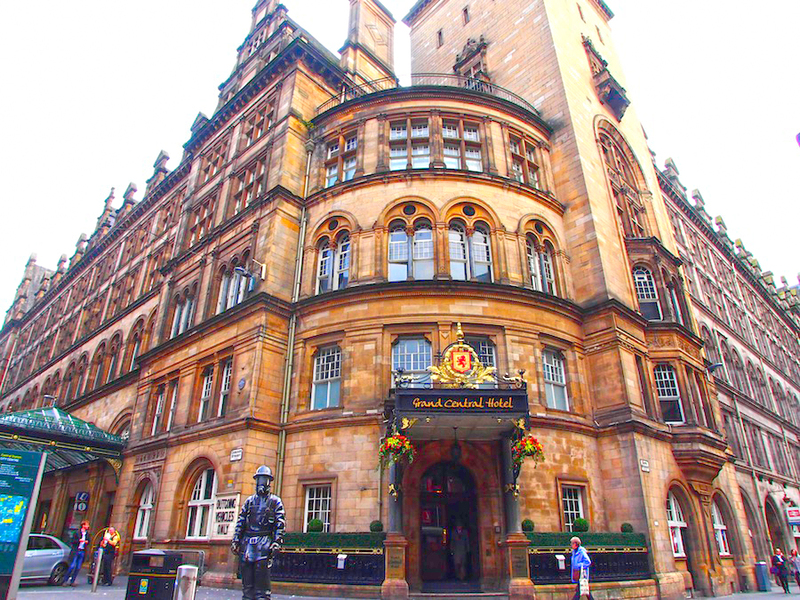 Grand Central Hotel: first opened in 1883, then re-opened just four years ago after an 18-month renovation, it is termed ‘the grand dame’ of Glasgow. Located next to the city’s main train station, with its doors leading straight into the concourse, it exudes a sense of history. A combination of a strong cosmopolitan influence and an abundance of local produce from the surrounding Scottish countryside means Glasgow boasts many fine restaurants. Cail Bruich: meaning ‘eat well’ in Gaelic, this is an intimate, family-run restaurant led by Chris, a young chef whose talents are reflected in diverse dishes including pre-starters of coconut sabayon with curry royal and curry hazelnut; Veloute of pumpkin, buttermilk royal, sage and parmesan sable; and succulent mains such as Perthshire pheasant with spelt grain, artichoke, girolle mushroom and truffle sauce. Two Fat Ladies: soft lighting and cozy cushioned wall booths make for romantic dining. Cullen Skink, the local chowder, is amusingly described as ‘a hug in a bowl’ while pasta lovers enjoy homemade ravioli with roast pumpkin, Amaretti biscuit, pea and sage cream, with roasted pumpkin seeds adding a nutty flavor. It’s hard to beat a dessert of warm dark chocolate and Chinese stem ginger with toasted almond ice cream. Tempus: located within the historic Grand Central Hotel, this restaurant provides an impressive ambiance with sturdy large columns and wall murals of Glasgow train scenes. Pan-fried scallops with lentils, and bacon in a delicious creamy sauce are among the starters, while duck breast, with wilted greens, potatoes, wild mushrooms and red wine jus, is cooked just right – seared crisp with a tender, pink interior. Bistro du Vin: dining at the Hotel du Vin’s bistro in the leafy West End suburb makes one think of a bygone age, a Victorian building with high-ceiling, marble fireplaces and ornate moldings. Its classic menu offers mains such as pork belly confit on a bed of parsnip puree and braised lettuce and pan-fried coley with warm potato salad and tomato and herb sauce, as well as starters including pumpkin and sweet potato veloute and chicken liver pate on toasted brioche. 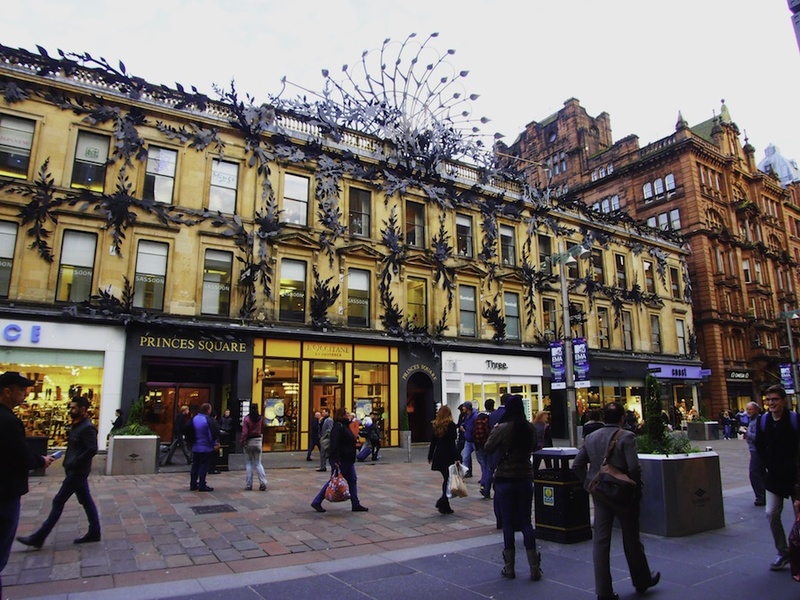 If museums, art galleries, sports events and fine cuisine isn’t enough to satisfy, it should also be added that Glasgow boasts the largest retail space in the UK after London which also encompasses its downtown ‘style mile’ square that includes Argyle Arcade, House of Frasers, Buchanan Galleries, Princes Square, St. Enoch Centre, John Lewis and Debenhams. For the more environmentally aware, Glasgow also has 90 parks and gardens. Posted in DestinationsTagged architecture, BBC Scottish Symphony Orchestra, Bistro du Vin, Brad Pitt, Britain, cafes, Cail Bruich, celtic, Charles Rennie Mackintosh, citizenM, city break, city destination, Club Noir, cuisine, culture, Edwardian, football, George Square, Glasgow, Glasgow City Council, Glasgow Royal Concert Hall, Glasgow School, Glasgow School of Art, Gothic, Grand Central Hotel, holiday, Hotel du Vin, Hotel Indigo, hotels, Kelvingrove Art Gallery, King's Theatre, modern art, museum, music, O2 Academy, People's Palace, Princes Square Shopping Centre, restaurants, Riverside Museum, Royal Scottish National Orchestra, Scotland, Scottish Exhibition and Conference Centre, Scottish Opera, Tempus restaurant, the BBC Scottish Symphony Orchestra, the National Youth Orchestra of Scotland and the Royal Scottish Academy of Music and Drama, The Royal Concert Hall, the Royal Scottish National Orchestra, Theatre Royal, Tron theatre, Two Fat Ladies restaurant, UNESCO, vacation, Victorian, winter gardens, World War Two, World War ZBookmark the permalink.